After thrilling club goers at TAO in 2011, “Halfway to EDC” returns in 2012 and expands to all TAO Group venues in Las Vegas. The joint efforts of Insomniac and TAO Group will cater to electronic dance music fans and start the countdown to the 17th annual EDC Las Vegas, which takes place June 21 - 23, 2013. 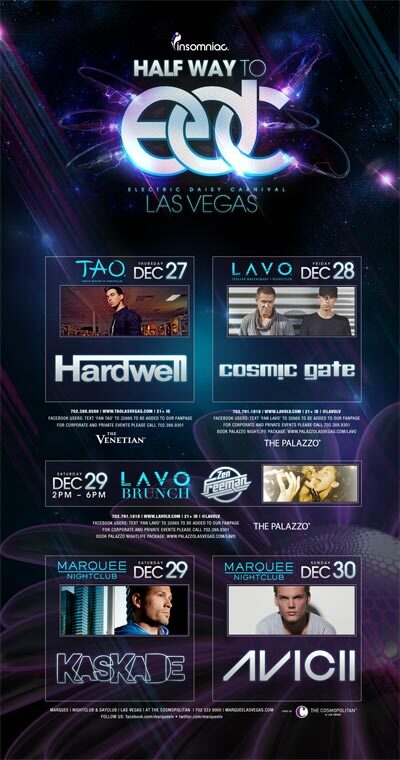 Halfway to EDC kicks off at TAO Nightclub on Thursday, December 27 with a special DJ set by Hardwell and continues on Friday, December 28 at LAVO Nightclub as Cosmic Gate headlines. LAVO’s Saturday Champagne Brunch will feature Zen Freeman on December 29, with Kaskade at Marquee Nightclub that night. Avicii will round out the festivities at Marquee on Sunday, December 30. The first allotment of tickets for EDC Las Vegas sold out in less than an hour, demonstrating resounding worldwide anticipation for the festival’s return under the desert sky next summer to the Las Vegas Motor Speedway. Tickets go back on sale January 9, 2013, at www.electricdaisycarnival.com.